PANZA celebrates National Poetry Day, 28 August 2015, with a classic New Zealand poem on the famous rugby league ground Carlaw Park by Francis Cloke (1860-1941). 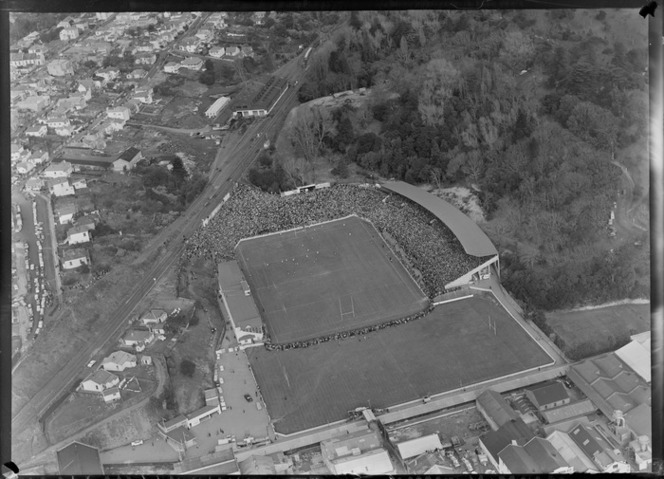 Carlaw Park was for many years during the amateur era the home of Auckland and New Zealand Rugby League. Named after founder James Carlaw, a senior figure in a prominent League family, Carlaw Park matches date from 1921 until 2002, when the park was eventually condemned. Mount Smart Stadium became League’s new home. City v Newton was the park’s first match. In those days, Rugby League was in hot competition with Rugby post-World War One. 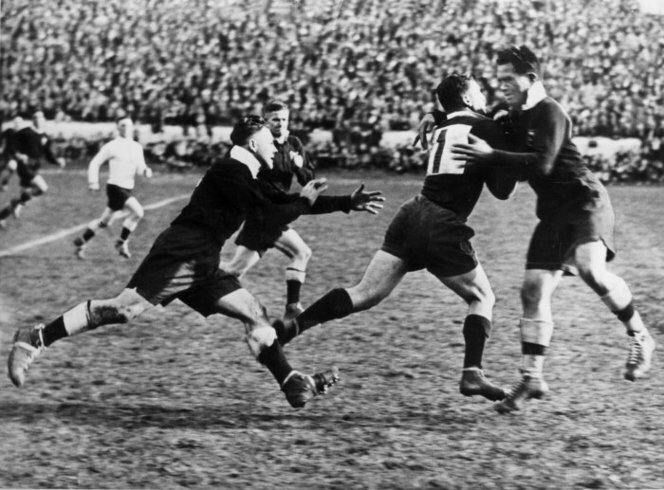 The Auckland Rugby Union changed their playing rules during the 1920s for fast running rugby and imposed bans on players who switched codes in an effort to stave off the competition from League. However, the All Black Invincibles tour of 1924-25 enhanced Rugby’s reputation as it continued to dominate against the League code and other winter sports like association football and hockey. Auckland League legend Karl Ifwersen switched codes and became an All Black in 1921. Later, in the 1930s, All Black greats George Nepia and Bert Cooke switched codes and graced Carlaw Park. Francis Cloke’s poem, ‘Carlaw Park’, has genuine qualities to it. A rare poem on the League code in New Zealand, it strikes home as it paints a delicate portrait of a rugged sport, and is unafraid to espouse the sport as a form of athletic art. The poem first appeared in differing form as ‘Ode to Carlaw Park’ by “F. C., Parnell”, in the Rugby League News, 16 May 1925 (according to the 100 years, Auckland rugby league history, 2009). On whose branches the singing birds dwell. For what others are anxious to buy. And its value’s not measured in gold. As the boys play the game at command. Of endurance that all doth astound. A full thirty-five thousand clear view. Get full measure for all that they pay. To take players and spectators home. Cloke’s only collection (privately printed), Songs of New Zealand and Various Verses (Auckland, NZ: Dawson Printing), appeared in three editions: 1924, 1925, 1931. A regional Auckland poet, Cloke wrote popular verses on various Kiwi themes: sport (cricket, rugby, league, yachting, etc. ), the landscape, towns and bays, and celebrations of church, political, historical and military figures, including aviator Jean Batten. He was a contemporary of other New Zealand poets like the recently republished Robert J Pope (1865-1949). Some details on Cloke’s life are traceable. Cloke was born in the December quarter 1860, Launceston, Cornwall, UK. His father died when he was very young leaving his mother to raise the family alone. At age 9, Cloke began working in the coalmines in Yorkshire. In 1886, Cloke married Elizabeth Ross (1866-1935) and had a family with her. Francis, of the Parnell Methodist Church, worked as a labourer for Railways. They lived at 12 York Street, Parnell, Auckland, close to Carlaw Park. Francis was involved with coal mining at Kawakawa on arrival in New Zealand. Cloke was the father of six children: John, Francis, William, Arthur and two girls: “Mrs F W Johnson (Kamo)” and “Mrs F W Kirby”. John Cloke (1894-1916), a Railways engineer, was killed in action at the Somme, France, World War One, aged 22 years. The three other sons were all involved in Auckland sport, and further research shows a family connection to the League code. His son W E (Billy) Cloke, a warehouseman, was an Auckland Rugby League selector (1939-40-41), who selected George Nepia 1939 for Auckland, and earlier (as a player) had been a back (five-eighth, wing or centre) for Auckland’s Newton Rangers (a club that in 1912 and 1927 won the Fox Memorial club competition). Cloke was selected for the Kiwis in 1919 after a trial match. This was a tour of NSW and Queensland, and Cloke was included as a reserve back in the Fourth Test v Australia but didn’t play). An Auckland rep, Cloke played at centre in a famous win over Great Britain in 1920. Karl Ifwerson was his teammate. Cloke was then included as an emergency for the Kiwis v Great Britain but didn’t play. Billy also played cricket for Railways and was involved in yachting. Another son Francis George Cloke, a railways worker, was a yachtsman, regularly mentioned in Auckland newspapers in Sanders Cup contests (a winner in 1922 crewing with Desert Gold and in 1929 crewing as owner of Avalon). Proud father Francis wrote a poem ‘Desert Gold’ celebrating his son’s achievement. His final son Arthur Cloke, a caterer, was an opening batsman, an Auckland cricketer, for R.V. Cricket Club. Arthur played League like his brother Billy for Newton Rangers. PANZA recognises Francis Cloke as a poet of interest during the Edwardian and Georgian eras. He doesn’t appear in any New Zealand poetry anthology that PANZA is aware of. Auckland, 100 Years of Rugby League, 1909-2009, by John Coffey and Bernie Wood (Wellington: Huia Publishers; Auckland: Auckland Rugby League, 2009). An Illustrated History: Centenary 1910-2010: 100 years of New Zealand Rugby League (Auckland: New Zealand Rugby League, 2010).